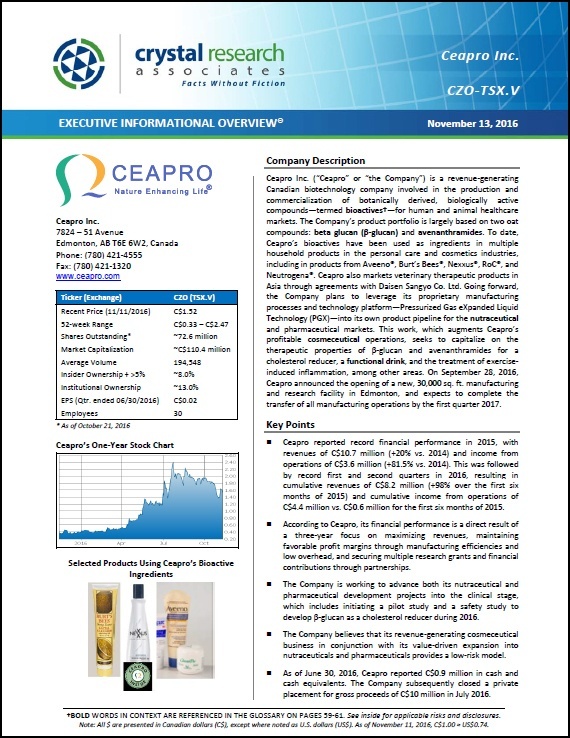 Ceapro Inc. (“Ceapro” or “the Company”) is a revenue-generating Canadian biotechnology company involved in the production and commercialization of botanically derived, biologically active compounds—termed bioactives—for human and animal healthcare markets. The Company’s product portfolio is largely based on two oat compounds: beta glucan (β-glucan) and avenanthramides. To date, Ceapro’s bioactives have been used as ingredients in multiple household products in the personal care and cosmetics industries, including in products from Aveeno®, Burt’s Bees®, Nexxus®, RoC®, and Neutrogena®. Ceapro also markets veterinary therapeutic products in Asia through agreements with Daisen Sangyo Co. Ltd. Going forward, the Company plans to leverage its proprietary manufacturing processes and technology platform—Pressurized Gas eXpanded Liquid Technology (PGX)—into its own product pipeline for the nutraceutical and pharmaceutical markets. This work, which augments Ceapro’s profitable cosmeceutical operations, seeks to capitalize on the therapeutic properties of β-glucan and avenanthramides for a cholesterol reducer, a functional drink, and the treatment of exercise-induced inflammation, among other areas. On September 28, 2016, Ceapro announced the opening of a new, 30,000 sq. ft. manufacturing and research facility in Edmonton, and expects to complete the transfer of all manufacturing operations by the first quarter 2017. * The Corporate Snapshot was last updated on November 13, 2016.